The spiral represents the flow of physical & spiritual energy. It symbolizes both solar & lunar, male & female energies. Long before the discovery of spiral galaxies, the ancients have used the spiral image to represent the universe, the earth's rotation, the moon's orbit, and as a symbol for growth. The Egyptian hieroglyph for spiral corresponds to the Hebrew vau, denoting cosmic forms in motion, or the relationship between unity & multiplicity. Leonardo Fibonacci (1170-1250) of Pisa, Italy discerned the logarithmic spiral in nature (nautilus shell & rabbit's reproduction rate). We may find more examples in artichokes & pineapples, the center of daisies & sunflowers, in subatomic tracks & spiral galaxies. The Fibonacci numbers are named after him (1, 1, 2, 3, 5, 8, 13, 21, 34, 55, etc.) where each number is the sum of the two preceding in the series. 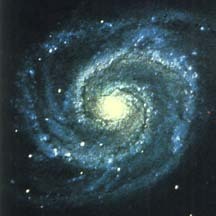 The spiral may be found in three forms: expanding (as in the nebula galaxies), contracting (like whirlwinds or whirlpools), or ossified (like the snail's shell). In the first case, it is an active sun-symbol, in the second & third cases, it is a negative moon-symbol. The ancient Greeks attributed the creative spiral (rising in a clockwise direction) to Pallas Athene, the Goddess of Wisdom, and the destructive spiral like a whirlwind (which twirls counterclockwise) to the Sea God Poseidon (Neptune). In yoga, the spiral is associated with the Kundalini force dormant at the base of the spine. During meditation, it awakes & rises like a serpent through the nerve centers (chakras) until it flows out of the head's crown (thousand-petal lotus of Buddha). The spiral is also connected to the breath & spirit, and the Egyptian Thoth is shown with a large spiral on his head. The spiral is used as an attribute of power, found in sceptre heads of Egyptian pharoahs and Christian popes & bishops. In primitive dances of healing & incantation, the pattern of movement develops as a spiral curve. The Sufi whirling dervish dances in a spiral to induce a state of ecstasy to experience the center of his being. Children are often seen to whirl around in playgrounds or parks, spinning themselves and giggling. Infoseek found 88,531 pages containing the word "spirals".